Yes, women have also become homicide-suicide bombers in Afghanistan. An Irish photojournalist with the hints of a French accent has the photos to prove it. In fact, she could not stop taking them, contributing to a premature detonation while she was still within the general blast area. 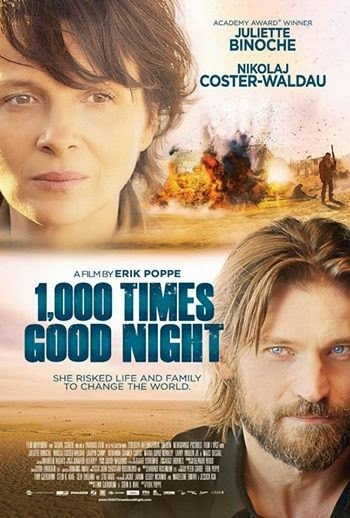 She survives, but the damage done to her family unit will be harder to patch-up in Erik Poppe’s 1,000 Times Good Night (trailer here), which opens this Friday in New York. If you find it problematic to compulsively document (and consequently somewhat fetishize) a terrorist bomber’s final hours, than congratulations. You had the appropriate human response. On the other hand, Rebecca argues she is bearing witness to the inhumanity of the world, but at some point bearing witness will come to resemble abetting through inaction. Good Night’s opening sequence consists of some truly provocative, visceral stuff, but to really understand it, you also have to see the symmetrically related conclusion. Ultimately, the film forces Rebecca to confront the ethics of her calling in gut-wrenching, soul-churning terms. However, to reach that point, we have to slog through some just okay family drama. When Rebecca is finally discharged from the hospital, she has clearly lost a step physically and might be gun-shy for the first time in her career. Her marine-biologist husband Marcus is ready to divorce her and their daughters are emotionally reeling from the near permanent loss of their often absent mother. Frankly, the youngster bounces back faster than moody teenaged Steph, perhaps because the older girl better understood the circumstances. For the sake of her family, Rebecca resolves to retire, but maybe she can be convinced to take Steph on a bonding tour of a Kenyan refugee camp, because it’s absolutely, positively safe as houses. If Juliette Binoche ever gave a bad performance, the sun might start orbiting the earth. In fact, she is admirably restrained, given the horrors her character witnesses and the bodily and spiritual wounds she suffers (had Meryl Streep overacted the part in her place, she would have been rending her garments and howling at the moon). 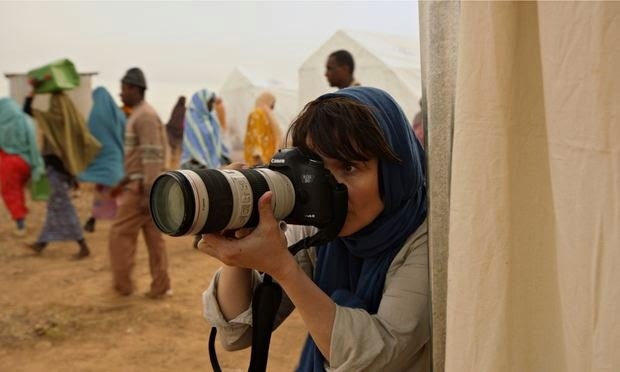 Instead, Binoche smartly and convincingly portrays a woman forced to emotionally blinker herself, for survival’s sake. While the mother-daughter melodrama becomes tiresome over time, Lauryn Canny is still quite impressive as Steph. Likewise, Game of Thrones’ Nikolaj Coster-Waldau does his best to scratch out something as the long suffering hubby. U2 fans should also keep their eyes open for Larry Mullen, Jr, who is perfectly respectable as Tom, a friend of the family. Good Night is an uneven film, but when it does connect, it is with a haymaker. You have to keep with it, but it is worth it if you do. Recommended on balance, 1,000 Times Good Night opens this Friday (10/24) in New York, at the Quad Cinema.